Schoorl is a charming village where there are all kinds of things to do. It lies in a wooded area right on the North Sea coast and is part of the municipality of Bergen. Schoorl lies along the edge of the Schoorl Dunes National Park. Schoorl is the most varied nature area on the Dutch coast, with the widest and highest dunes in the Netherlands. Schoorl is an excellent place for people who love peace and quiet and nature, where they can really feel at home. Schoorl lies in Noord-Holland right on the North Sea coast and close to Alkmaar. It is easy to reach by car. Schoorl does not have its own railway station but is easy to reach by bus from Alkmaar. From Schoorl you can cycle to the beach. A cycling trip through the dunes of Schoorl is a great way to start a fantastic day at the beach. Bicycles can be hired in Schoorl. You can plan a cycling trip for a lovely day enjoying the beach and the sea. For children, there is the climbing dune in the centre of Schoorl. Children can have a great time here, running and rolling through the sand. Adults can have fun here too and relive their childhood; or you could of course enjoy a seat at an outdoor café and watch everyone enjoying themselves. You can go on a relaxing walk through the woods or the dunes, and there are lovely cycling routes in this area. Schoorl is also fun for shoppers and has a charming centre where you can have a nice browse. The visitors centre Schoorlse Duinen offers all kinds of activities, and for the children there is the Kabouterpad Schoorlse Duin gnome treasure hunt. Along the path in the dunes of Schoorl, there are gnomes with various activities for the children to do. The children are given a rucksack containing everything they need to do the activities and they even get to wear a cute gnome’s hat for the treasure hunt. In Schoorl you will find the Hervormde Kerk reformed church dating from the 17th century, and certainly worth visiting. The Voormalig Raadhuisje, the former little town hall, was built in 1601 and is the smallest and oldest town hall in the Netherlands. The monument still has numerous original features such as the walls, the floors and the fireplace. The Kijkduin corn mill dates from 1772, and every Saturday the miller is at the mill, when it is opened to the public for a look round or a guided tour. The Monument on the Oorsprongweg in Schoorl is a memorial built from natural stone on the spot where the Nazi camp from the Second World War stood, which held Jewish prisoners and political prisoners before they were taken away to other camps. Art of Africa Beeldentuin sculpture garden. The charming garden of Hanny Weinbeck in Krabbendam (near Warmenhuizen) is home to stone sculptures by various artists from Zimbabwe. 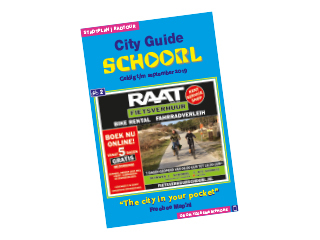 If you wish to see the best places in Schoorl, you can do the city walk from the Freebee Map in the brochure that you can order from this website by means of an SMS service. Then you can be certain that you have seen all there is to see in Schoorl. In the centre of Schoorl you will find many varied and original shops which you can browse round. You will find many shops as well as restaurants and cafés where you can stop off for a bite to eat and a drink. After a lovely walk, cycling tour or a great day at the beach, you can relax and enjoy a meal at one of the restaurants or cafés in Schoorl. In Schoorl you can enjoy a refreshing cup of coffee at an outdoor café, or a delicious lunch or dinner in one of the restaurants. Schoorl has several restaurants and cafés offering national and international cuisine. Whether you fancy a pizza or a leisurely meal at a four-star restaurant, you will find what you want in the centre of Schoorl. The village of Schoorl does not have many bars, pubs or discotheques. In the centre of Schoorl you will find a few places for a night out. For more nightlife, it is best to go to Alkmaar or Bergen which are both near by. The events calendar in the Freebee Map gives an overview of events taking place in Schoorl.